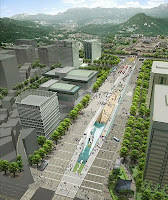 The new Gwanghwamun Square (광화문 광장) will be inaugurated in June 2009. 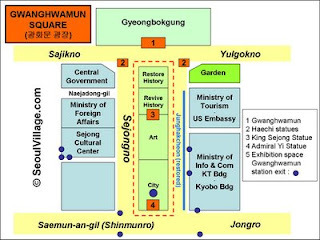 Actually, the square is a rectangle stretching over 740 m all along Sejongno, from Gwanghwamun itself (still under renovation in its original location) to the Statue of Admiral Yi Sun-shin at the cross with Jongro and Shinmunro. Until now, eight lanes of traffic were separated by a thin green band hosting old gingko trees. The idea is to develop the central section, open it to the public, and turn the whole street into a large plaza for special occasions. So this rectangle will be 10 to 34 m wide depending on the days, and much bigger if you include the large pavements on both sides. 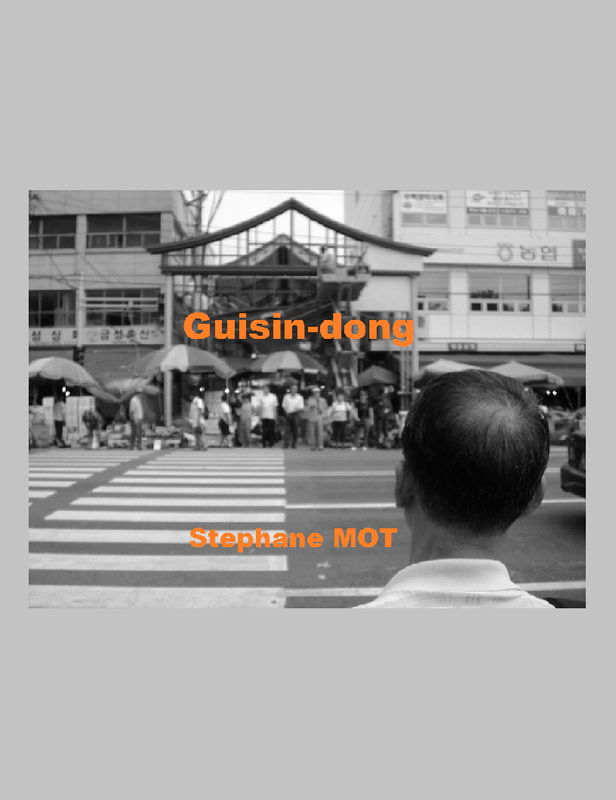 People will access this new cultural hub via lateral pedestrial crossings, and a gentle slope starting from Gwanghwamun Station, under Yi's feet. The Admiral will have some company : a statue of King Sejong himself, a little higher on the strip. After all, this road is named after him, not the great commander. Besides, two Haechi statues are to be installed on each side of Gwanghwamun. And not just to celebrate the new symbol of Seoul (see "Goodbye HiSeoul, hello Haechi") : you can see the stone lions on almost every old picture of Gwanghwamun. On certain pictures, a streamlet appears in front of the gate. The Junghakcheon, which connected to Cheonggyecheon, will be restored on the Eastern side of the Square, but symbolically : in this one meter wide and five centimeter deep Amazon, even maemis should be safe from drowning (remember "Save Korean Maemis" ?). More spectacular waterworks shall animate Gwanghwamun Square around Yi Sun-shin. The concept ? 600 hundred years of history celebrated in thematic sections, with a central section devoted to "Art" which, thanks to the new pedestrian crossings, almost draws a bridge between two local cultural spots : the Sejong Cultural Center and the less famous KT Building, a cool place where I like to have a drink while listening to decent jazz (friendly live concerts). Overall, it will reinstate downtown's traditional center and shorten distances between major cultural places. Passers-by will again own the heart of the city, and enjoy a better view on its most prestigious and beautiful perspective : Yi, Gwanghwamun, Gyeongbokgung, Cheonghwadae, Bukhansan. see updates right before the inauguration ("Gwanghwamun Square - Preview") and a few days after ("Gwanghwamun Plaza - The Aftermath").